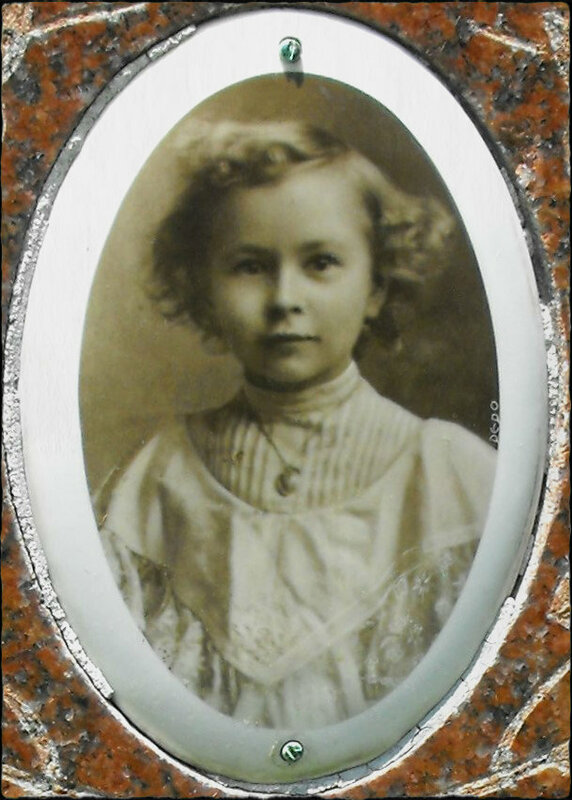 Another darling girl rests a few steps from Edna Miriam Paul‘s final resting place in Chicago’s St Luke Cemetery. 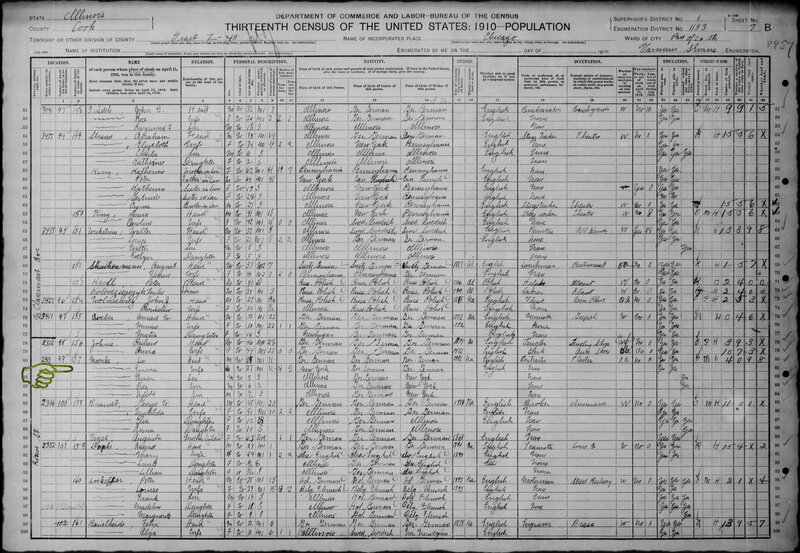 Isabel Moenke was born 31 July 1899, just in time to be recorded in the 1900 census. It was the only one in which she would appear. Her parents, Leo and Emma (nee Kaeding) were married in Chicago 01 Oct 1898  and Isabelle was their first child. The couple went on to have more children. I’m certain darling Isabel remained always in their hearts. 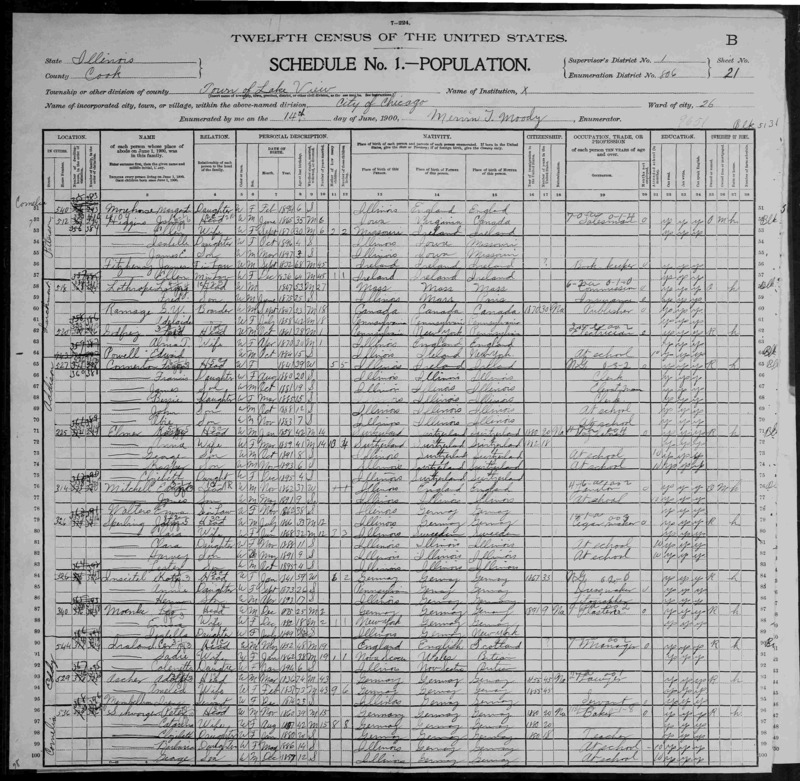 “Illinois, Cook County Marriages, 1871-1920,” database, FamilySearch (https://familysearch.org/ark:/61903/1:1:N7WK-YJG : accessed 23 May 2016), Leo J. Moenke and Emma Kaeding, 01 Oct 1898; citing Chicago, Cook, Illinois, 281350, Cook County Courthouse, Chicago; FHL microfilm 1,030,288. I am the daughter of Clarence Menke, Isabelle’s brother who was born in 1921 the last and late in life son of Leo and Emma. That whole section are all family members. My dad dropped the “O” from Moenke in school as he begot the nickname Monk,which stuck throughout his life.The Kaedings are the grandparents of Isabell as well as the Guderian’s. Fellgers are also related etc. Judith, I’m glad you stumbled upon my post. Although Isabel’s loss must have been devastating to her family, it’s comforting to know others know her story. 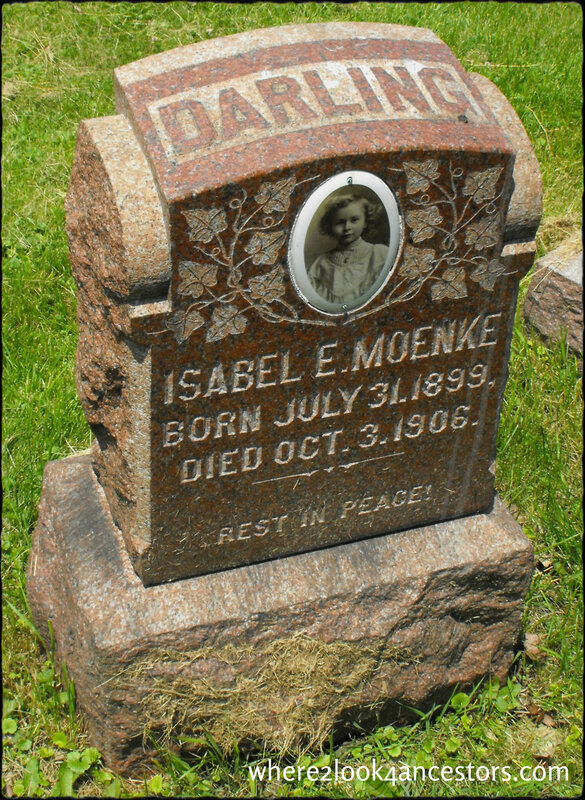 Isabel E. Moenke was my dads, Elmer Leo Moenke’s, little sister. She was only seven years old when she died, the only girl in a family of five children. My uncles being Harold Moenke, Clarence Moenke and Roy Moenke. I can’t even imagine how difficult it must have been for them. What a tremendous loss that must have been – such a tragedy.